At seven years old, the young Brian Armstrong was captivated by the pages of an old, yellow-bordered magazine. It wasn't just the bare-breasted tribeswomen that attracted his attention. Pictures of far-off jungles, exotic wildlife, and intrepid explorers prompted the boy to declare, "That's what I'm going to do when I grow up." Twenty-five years later, that dream came true. The boy from Bendigo found himself travelling from one death-defying adventure to another as a seat-of-the-pants expedition filmmaker for the same company that produced those yellow-bordered magazines. Coping with deadly snakes, volcanoes, acid lakes, malaria, armed rebels and even a helicopter crash became part of a day's work. Time and again Brian asked himself the same three questions: "How did I get here? ", "How do I get out of here?" and, most importantly, "What's to drink?" Against his employer's strict anti-alcohol policy, this irreverent larrikin started the Exotic Booze Club. Brian exhorted fellow filmmakers and explorers to return to the office to share strange liquors and wild tales of daring exploits. 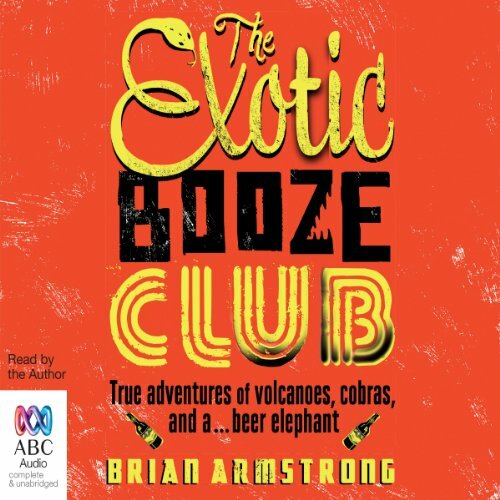 This audiobook gives you the true stories from behind the scenes of Brian's most dramatic films, framed by the rise and fall of the one and only Exotic Booze Club. This book is an adventure! If you like travel books, you will love this book. Brian Armstrong is a very good writer and he guides you through his adventures in a great behind the scenes look at what it is involved with making a national geographic film. Excellent witting and narration!